Indidoll Mani's dress is inspired by Rani lakhmibai. Festive maroon kurti is made of polycotton with an angrakha style neckline, mirror emroidery border along neckline, sleeve and at the hemline. This kurti comes along with contrast golden yellow pant. 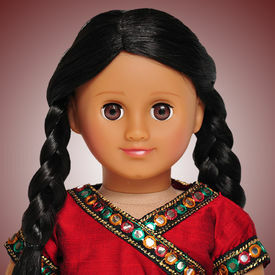 Mani's Doll Package (Festive Maroon) contains the following: 1. A beautiful collectible 18" doll with 19th century period Mani dress. Indidoll Mani's dress is inspired by Rani lakhmibai. Festive maroon kurti is made of polycotton with an angrakha style neckline, mirror emroidery border along neckline, sleeve and at the hemline. This kurti comes along with contrast golden yellow pant. 2. A colourful illustrated Mani book with a story of adventures of Mani.